The new M Box 2 Pro is the first portable Pro Tools interface that connects via Firewire rather than USB. 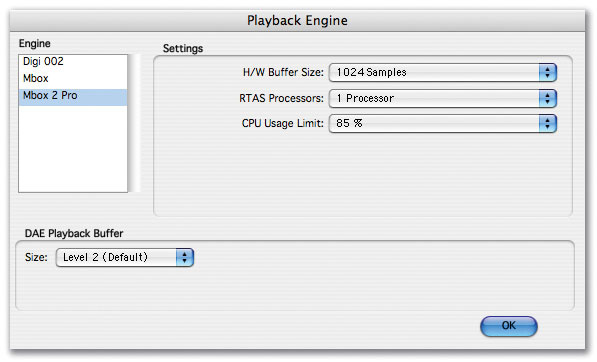 As a result, users get more I/O, a phono preamp and word clock support among other bonuses. At last! Just over a year after bringing out the M Box 2, Digidesign have finally done it: they have released an M Box that connects via Firewire rather than USB. Having broken away from the shackles of the USB 1.1 protocol, they have freed themselves to produce a portable interface that can handle more inputs at higher sample rates. The M Box 2 Pro can be powered via the Firewire interface if you use a six-pin cable, or with the included power supply if your host computer offers a four-pin Firewire interface. There's also a lot that hasn't changed with the M Box 2 Pro, such as the Pro Tools software, so I won't spend too much time going over that here. For more information and background knowledge, read the Pro Tools 7 review in the January 2006 issue, the M Box 2 review in the November 2005 issue, the 002R review in the October 2003 issue and the original M Box review back in the June 2002 issue. The M Box 2 Pro is a little bigger than the M Box 2, and only slightly heavier, at 1.5kg to the M Box 2's 1.23kg. It follows the same basic design, though Digidesign have wisely dropped the handle idea they introduced on the M Box 2. (I don't know anyone who uses an M Box 2 who has kept the handle on — the way it sticks out makes the M Box 2 very awkward to store.) Digidesign have reinstated the combo sockets from the original M Box for the mic/line inputs, and repositioned the DI inputs to the front panel. The M Box 2 Pro still has input selection buttons that are slightly confusing, in that the word 'Line' doesn't appear on them — to access the Line input you select Mic and Pad. The original M Box with its LEDs on the input selection was completely clear, even if the 'feature' of it defaulting to mic input was a pain. Digidesign have maintained the separate monitor output that they introduced on the M Box 2, and have brought back the proper separate line outputs that the original M Box had but the M Box 2 didn't; these have also multiplied, giving six analogue outputs. The Mix control has gone and so the Low Latency monitoring feature is handled by the Pro Tools software, just as it is with the 002 and 002R interfaces. This addresses one of the other 'cons' in our M Box 2 review, as Low Latency recording now applies to the digital inputs as well as the analogue ins. Digi have reintroduced the dual headphone sockets that the original M Box had, and better still, each headphone socket has a separate volume control, and one of them has the option to monitor outputs 1/2 or 3/4. This means that with no additional hardware you can record your 'talent' with a headphone mix routed to outputs 3/4 whilst you, as the engineer, can monitor the main outputs independently on the other headphone output. Alternatively, it means you can have two sets of headphones attached and have them at different volumes. I know a number of users who will find that feature very useful. The number of simultaneous inputs has increased from four on the M Box 2 (two analogue and two digital) to six (two mic/line, two line and two digital), and the MIDI In and Out sockets introduced with the M Box 2 are retained. A nice 'pro' touch is the addition of external word clock sync, both in and out, so it is now possible to digitally lock an M Box 2 Pro system to an external clock, which is something that even the M Box 2 Pro's bigger brothers the 002 and 002R can't do. Finally, Digidesign have added a footswitch socket, but the small print includes a note saying this feature won't be available at launch; apparently support is 'expected' in 2007, but I am not going to hold my breath on that one! According to Digidesign's compatibility charts, system requirements and the range of compatible machines for the M Box 2 and M Box 2 Pro are very similar. One good piece of news for Mac users is that the former's lack of support for phantom power with first-generation 1.67GHz Powerbooks has gone away, as the M Box 2 Pro is not affected by the variable capabilities of the USB ports on the various G4 Powerbooks. In addition, the 1GHz and 1.25GHz Powerbooks, which failed qualification for the M Box 2, are on the approved list for the M Box 2 Pro. The Windows laptop charts, meanwhile, show that a few machines that are on the M Box 2 list have not got approval for the M Box 2 Pro, such as the IBM Thinkpad T43 (and, of course, Firewire is not standard on all Windows machines). Digidesign had already released a revision version of the M Box 2 Pro software two days before the M Box 2 Pro was released, but the supplied Pro Tools 7.1.2 software installed uneventfully onto my Powerbook (there is a separate version 7.1.3, with its own install disc, for Intel Macs), writing over my v7.1cs8 software as you would expect — it didn't even ask for my serial number, but I suppose I already own PT software of the same generic version. Although Pro Tools will work on non-admin accounts you must log in to an admin account to install the software, and remember to turn off the Spotlight shortcuts as well as the Dashboard and Exposé F9 to F12 shortcuts, so they don't conflict with Pro Tools Record keyboard shortcuts. I have DV Toolkit 2 on my Powerbook, so I installed the Digitranslator and MP3 update options to make sure I had the latest versions of these extras. The software, of course, is essentially Pro Tools 7, and so looks no different to the 7.1 software that was on my machine before. The M Box 2 Pro also comes with the Ignition Pack and Digidesign's instrument plug-in Xpand!, as well as the usual free Bomb Factory plug-ins. One of the first things I wanted to check was whether the Pro Tools software shipped with the M Box 2 Pro would run the other LE hardware as well, or whether 7.1.2 was a special version which would only work with the M Box 2 Pro (the M Box 2 needed a special version of Pro Tools 6 when it first came out). So, having checked all was well with the M Box 2 Pro, I quit Pro Tools, unplugged the M Box 2 Pro and plugged my original M Box into the left-hand USB socket on my Powerbook (some versions of the G4 Powerbook won't support M Boxes on the USB socket on the right-hand side of the machine, so I now always plug an M Box into the left-hand side automatically). I ran Pro Tools 7.1.2 and up came the lights, including the USB light on my original M Box, and there were no complaints from Pro Tools about recognising the hardware. So next I opened a Session, and hey presto, it played! Then, for good measure, I tried the same thing with my 002R, and that worked too. The supplied version of Pro Tools supports older M Box and 002 interfaces too, allowing you to switch between them (though not to run them simultaneously).Now here is the extra special thing I discovered by accident. I swapped back to the original M Box to check something, and when I loaded up Pro Tools and played the Session, I heard audio coming out of the headphones that were still plugged into the M Box 2 Pro. This confused me because the M Box's lights were all on, as you would expect. 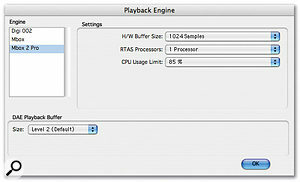 A trip to Playback Engine in the Setups menu showed that Pro Tools had recognised both units, but the M Box 2 Pro was selected. When I tried to select the M Box, Pro Tools came up with a screen I had only seen before on HD systems when swapping Playback Engines, advising me that Pro Tools would save and close the current Session before changing the Playback Engine and reopening the Session. So I clicked Yes, expecting it to all go horridly wrong, and the Session reopened fine and ran through the M Box even though the M Box 2 Pro was still plugged in! I wondered if Pro Tools would recognise my 002R in the same way, so I quit Pro Tools, plugged the 002R into the other Firewire socket on the back of the M Box 2 Pro, and loaded Pro Tools again — and that worked just as well, giving me a list of different Playback Engines to choose from in the Engine column. The upshot of this is that it is now possible to swap from one interface to another at will. Just to be very cheeky I unplugged the Firewire interfaces whilst Pro Tools was still running but the Playback Engine thought that they were still connected, and when I tried to swap to one of them, Pro Tools closed and saved the Session fine but then came up with an error message that 'The selected Playback Engine didn't support the sample rate of 44.1k'. I clicked the OK box and the Session didn't reopen, so I went back into the Playback Engine dialogue box and tried to re-select the M Box, which was still plugged in, but at that point Pro Tools had had enough and crashed. An unfair test, I know, but I wanted to see what happened! Something that has bothered me about the M Box family to date is that the analogue outputs produce a lower level than those of the 002 family and the HD interfaces. On those interfaces I would expect that a tone file created at -18dBFS would produce an analogue output of 0dBu (assuming that the Calibration option on the HD systems was set correctly; there is no Calibration option on the LE software). The M Box family to date has produced a lower level (around -12dB for a tone signal of -18dBFS). In broadcast settings, where you are dependent on external PPM metering for level monitoring, this has been a pain. With its 'Pro' label, I hoped that the M Box 2 Pro might deliver a pro-level output, so I checked with my audio level meter and found that it didn't. For a test tone of -18dBFS, the M Box 2 produced an analogue output level of -12dB. The original M Box produced an output of -14dB, whereas the 002R did produce an output level of 0dB. I can only assume that the higher-level output cannot be achieved because of limitations on the amount of power the M Box 2 Pro can receive from the host down the Firewire cable. I also wanted to see if the Pro label meant any improvements in the mic preamps, so I ran a test with speech. This can be quite telling on a mic preamp, especially in revealing its noise floor — you often need high gain settings for speech, especially in radio, when you often want to create a more intimate sound. I first recorded using my original M Box with its Focusrite preamps, and then, without changing the mic position, swapped over to the M Box 2 Pro and recorded the same voice again. To my ears, the M Box 2 Pro sounded smoother and fuller, and the 'silence' sounded less grainy. I don't own an M Box 2 so I was unable to compare the preamps in that model. I then tried plugging in two phantom-powered mics (my M&S pair, consisting of an Sennheiser MKH40 and MKH30), and the M Box 2 Pro had no problems handling these even when the computer was running on battery power alone. The headphone outputs are satisfactory, and I had no problems driving both low-impedance and high-impedance headphones with them. Whilst recording I noticed a nice feature of the input section's peak level lights. The peak level lights go green at around -55dBFS, so acting as a 'signal present' indicator. Then comes the clever bit: the lights go orange at around -2.5dBFS, and go red and stay on for three seconds if the signal hits 0dBFS. This is a very neat touch. Connectivity with host computer: Firewire. Power source: Firewire (if a six-pin connection is available) or external power supply. Supported sample rates: up to 96kHz on analogue I/O and S/PDIF output, up to 48kHz on S/PDIF input or when using word clock. Analogue inputs: four, two on mic/DI/line inputs using XLR/jack combi connectors plus separate front-panel jack sockets for the DI inputs, two on rear-panel TRS jack sockets or RCA phonos (via phono preamp). Analogue outputs: six, four on balanced TRS jack sockets, two on stereo unbalanced TRS jack socket. Headphone outputs: two, with independent volume controls; one can monitor either outputs 1/2 or outputs 3/4. Digital I/O: stereo electrical S/PDIF in and out, plus word clock in and out on BNCs. MIDI I/O: one input and one output, with MIDI time stamping support. Low Latency monitoring: via software. Switchable 48V phantom power for the mic inputs. The two extra line inputs (3/4) offer a choice of connectivity. You can use the conventional TRS balanced jack inputs, but the M Box 2 Pro also includes an RIAA phono preamp, with two phono sockets for connecting a turntable. You select the phono preamp by pressing the Phono button on the front panel to the right of the Aux input level. Digi have also thoughtfully included an earth terminal, which most turntables need to stop them from humming. The Startup Guide is a little confusing here, in that it states 'Plug in your turntable, mixer, or similar outputs into the Aux In Phono inputs (L and R)'. However, taking a mixer output into the phono inputs would overload the inputs, which are specifically designed to accommodate the output straight from the turntable cartridge and process it via the RIAA EQ curve as well. Note also there is only one combined input level control for both inputs 3/4, which Digidesign label 'Aux Input'. Unlike any of the other interfaces in the current Pro Tools LE range, the M Box 2 Pro has the facility to use word clock, both in and out, so it is now possible to lock up a Pro Tools LE system to external word clock, which is not available even on the 002 or 002R. However, there are a couple of issues with the M Box 2 Pro's digital I/O that I want to bring your attention to. First, you cannot have a Session with an external clock source at a sample rate above 48kHz, whether it comes from the word clock input or the S/PDIF input — you can output a 96kHz Session via the S/PDIF output, but you cannot use the S/PDIF input above 48kHz. It is also not possible to use the S/PDIF input at the same time as the external word clock input, so you cannot input digitally via the S/PDIF into the M Box 2 Pro whilst externally clocking it using word clock. Both of these do limit the flexibility of the M Box 2 Pro, but the external word clock feature is nevertheless a major step forward in the Pro Tools LE product range. Word clock I/O is a first for any interface in Digidesign's LE product range, and the phono preamp and additional outputs are nice touches. One good outcome of the way the digital I/O is handled is that the S/PDIF input will not pass audio unless S/PDIF has been selected as the clock source. There is a very nice warning on the Hardware Setup window that says 'Note: The S/PDIF input may only be used if S/PDIF is selected as the clock source. If the clock source is set to S/PDIF and no S/PDIF input signal is present, all audio will be muted until the clock source is established'. This will hopefully put a stop to those clicks and spits that happen when you accidentally use the S/PDIF input without first selecting it as your clock source. This is a new feature in the software, and offered only when the M Box 2 Pro is in use. Another nice touch is that from within the System Preferences there is now an M Box 2 Pro pane which enables you to mirror the analogue and S/PDIF outputs, although there is no mention of AC3 as there is in the M Box 2 preference pane. Digidesign have finally released the portable Firewire-based interface that many people felt the M Box 2 should have been. The M Box 2 Pro packs a lot into a small box, and Digi have tried to please a broad range of users with this new version. The external word clock is a welcome feature for the 'post' community, the phono preamp is great for the DJ community and the extra I/O is great for everybody without making the box too big and defeating the object of making it portable. My only real disappointment is that there aren't four mic preamps. That would have made surround acquisition so much easier, as well as making it possible to handle small sessions on the road without any extra kit. Oh well, I can hope that that might be something for the M Box 3! If you have an original M Box, as I do, it is definitely worth trading it in for an M Box 2 Pro. M Box 2 owners may still find it worth trading theirs in too, especially if you are fed up of errors forever popping up because the USB buss can't keep up. I say trade in, because although I had hoped that Digidesign might offer an upgrade plan for M Box, Audiomedia III and Digi 001 users at least, they have stated that they have no plans to offer an upgrade plan for existing owners to upgrade to an M Box 2 Pro. There is, however, the option of an M Box 2 Pro Factory Pack, which bundles a very tempting selection of plug-ins and additional software for a relatively small extra cost, and I can imagine lots of people choosing this option. Host-powered without the limits of the USB ports. Analogue outputs and separate monitor outputs. Lack of external clock support for high sample rates. The M Box 2 Pro is a convenient Firewire-based Pro Tools interface with some nice touches like word clock support, a phono preamp and dual headphone outputs. £564; M Box 2 Factory Pack £634.50. Prices include VAT.